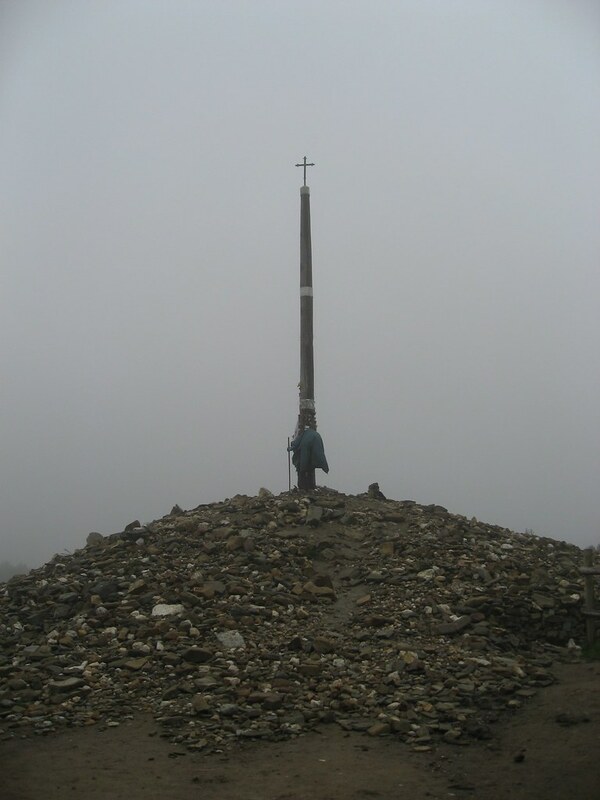 Well, today I decided to go the extra mile (literally, ha) and walk 38km from Santa Catalina de Somoza to Molinaseca. I should have stopped in pretty El Acebo [the albergue above the bar, and the food looked fantastic] like the rest but I felt like I wanted to move forward that extra little bit. I started early: woke up at 5:30am (once again i couldn't sleep) & was out the door by 6 am. Walking in the dark is a fairly good motivator and by studying the road the day before, I was fairly confident in the direction I was going. Unfortunately, today was one of wind and cold and rain - not so bad as the one on the 1st of May, but enough drizzling to keep the waterproof stuff on for the whole day. Moving into la Cordillera Cantábrica the flats of the meseta end, and it was up, up, up towards the famous eerie Foncebadón (read Shirley Maclaine or Paulo Cohelo.) I had originally planned to stay there, but the distance was too short [for what I had walked so far]. It was miserable both in weather & in my experience at the local bar; a horrible bus load of camino tourists - the kind that gets driven from point to point while a van takes their luggage/backpacks, & they walk a small amount to the point of interest. By the time I finished my café con leche in the bar, all I wanted to do was move on. uh oh, 10:43pm now. No wonder the snoring is in full force. Sigh. Ipod time.